Many people find it difficult to achieve full effects by smoking dried Salvia divinorum leaves. Those who are successful generally require multiple large hits off a pipe or bong. Typical smoked doses with plain leaf are between 0.2 to 0.5 gram, about one large, dried leaf. For sublingual consumption, a typical dosage range is 10-50 grams of fresh (wet) leaf, approximately equal to 6 to 30 leaves, or 2-10 grams of dried leaf, usually reconstituted before consumption. Salvia divinorum extracts generally come in 5x, 6x and 10x concentrations. Dramatically less material is required the more concentrated the extract is (10x is more concentrated than 5x). A single hit of extract may be more than enough at any of these concentrations. Rarely sold at parties. Dried leaf is sold for 50-100 USD per ounce. Extracts are sold for 20-50$ per gram. Live plants prices vary based on age, size, and health of plant. Salvia divinorum is federally unscheduled in the United States meaning it is legal to possess and sell. The federal Analog Act generally requires chemicals be chemically similar to another scheduled substance to qualify. As salvinorin-A and salvinorin-B (the primary active chemicals in Salvia divinorum) are chemically very different from any scheduled substance, they are unlikely to be targeted under that act. Since mid-2005, Salvia divinorum has been made illegal to possess in several U.S. states (DE, FL, IL, KS, MS, MO, ND, OK) as well as a number of countries (Australia, Belgium, Denmark, Germany, Italy, Japan, S. Korea, Sweden). Salvinorin A and Salvinorin B are naturally occurring chemicals which are not structurally similar to any other common psychoactives. Works on the Kappa-Opioid receptor system. Salvia Divinorum was first recorded in Western literature in 1939 by Jean Basset Johnston while studying psilocybin mushroom use in Mexico among the Mazatecs. R. Gordon Wasson continued to document its use between 1951 and 1962 and confirmed its psychoactivity on himself. The use of Salvia Divinorum likely dates back far into early Central American history, but documentation is so far very slim. 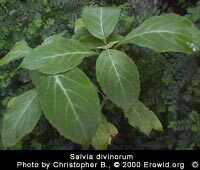 Salvia divinorum remained an obscure entheogen until the mid 1990s when Daniel Siebert and others began self experimentation and sales of the leaf began over the net. Salvia divinorum; Salvia; La Pastora; Yerba Maria; The Shepherdess; Diviner's Mint; Diviner's Sage. Depending on dosage, the Salvia divinorum experience can vary from a subtle, just-off-baseline state to a full-blown psychedelic experience. At higher doses users report dramatic time distortion, vivid imagery, encounters with beings, travel to other places, planets or times, living years as the paint on a wall or experiencing the full life of another individual. Needless to say these can be extremely powerful experiences and should only be attempted with a sitter. While most people remain unmoving during the experience, some individuals will attempt to get up and walk around while in a completely dissociated state. While sub-threshold effects are somewhat innocuous--leading some people to be cavalier in subsequent experiences--once full effects are achieved, many people find S. divinorum to be unpleasantly overwhelming and more scary than fun. As has been found with pharmaceutical kappa-opioid agonists, Salvia divinorum is aversive for many who try it. When smoked, the effects of Salvia divinorum generally come on very quickly. First effects are noticed between 20-60 seconds after smoking, increasing to peak effects within 1-2 minutes. The primary effects of Salvia divinorum last between 5-15 minutes. There is then a comedown period of 20-40 minutes before returning to baseline. As with many smoked substances, some Salvia divinorum users report throat and lung irritation after use. Some people also experience headaches and mild irritability following use. Use a Sitter. Some percentage of users will attempt to stand up and move around during the Salvia divinorum experience. Having a sitter present can reduce the chances of injury or other problems. Individuals currently in the midst of emotional or psychological upheaval in their everyday lives should be careful about choosing to use psychoactives such as Salvia divinorum as it is possible that could possibly trigger even more difficulty. Individuals with a family history of schizophrenia or early onset mental illness should be extremely careful because strong psychoactives have been known to trigger latent psychological and mental problems. Salvia divinorum is not known to be either physically addicting or likely to cause psychological dependence. Withdrawal effects following discontinuation have not been reported. As with most substances, some people will use it more frequently than they are comfortable with. There appears to be no tolerance with Salvinorin-A, so an experience can be extended or amplified by smoking more.